Guess what? 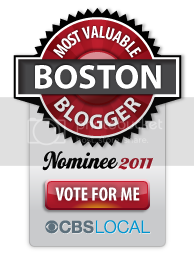 My blog was nominated as one of the finalists in the Lifestyle category in CBS Boston Most Valuable Blogger Awards 2011! Wowza! This is a huge honor and I would really, really appreciate your vote. Simply click the button above or vote here. Voting is open from now through September 9th and you can help me win by voting for me once daily until then! Voted. Feel free to send me a reminder to vote each day. Voted for ya cuz once again u rock!!!!! 🙂 hope u win! CONGRATS!!! Following you on here now too as a GFC follower! Check out my site if you get a chance! I’m new to the blogging world and would love your feedback! Congrats and voted for you! What a nice honor. I was nominated as a finalist too for Connecticut! I voted for you- GoodLuck! I voted for you, MM!